We have officially launched the Kenyan for our VIP subscribers with a 10% discount. Join the VIP email list below (don’t worry, it’s free) and you can get the same perks! Our newest coffee is a top shelf coffee purchased from Café Imports (one of the most respected coffee importers in the nation). Not only can you find the best cafetier here, they also bring in the best of the best coffees from around the world every year in what they call their Aces Program. They bring these 4-5 green coffees in and sell them in small lots so the maximum number of people have the chance to experience them. 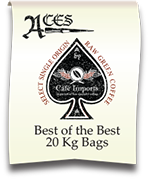 From Café Imports: “Aces Single Origin offerings are not just bags of green coffee but vehicles for empowering people and revolutionizing the coffee quality experience.” So, we are THRILLED to be able to roast up some of the best coffee in the world and offer it to you! There is no way you will be disappointed in this coffee. It is an experience! It’s all about the bean!!! A little info on the bean. This unique varietal is a look back into the past. French Mission is an original Bourbon varietal that was introduced by French Missionaries in the late 1800’s to Kenya. Over 76 centimeters of rain a year, combined with the deep red volcanic soil and temperatures of 70 to 82 degrees Fahrenheit, come together to provide the perfect conditions for this coffee to express its genetic treasures. This coffee was processed naturally as opposed to the more normal wet processing for coffee. With natural processed coffee the cherry is allowed to dry around the bean before it is removed. Whereas in wet processing the cherry is removed right away from the bean using water and a hulling process. The Natural process can create a more fruity cup than normal. Of course the quality of the coffee has to great in order for this process to have its maximum effect. And this coffee has AMAZING Quality. It will be different than almost every other coffee you’ve had. There is a definite tartness at the beginning of the cup that gives way to a sweet after taste. As the cup cools down you will notice the tartness dim down and a strawberry flavor begin to take over. Towards the end of the cup as it cools, the fruit flavors continue to grow along with a caramel sweetness. If you have never tasted a coffee that has natural fruit flavors you are in for a surprise! Get on the email list or be square! This Coffee is the best we have ever offered and we are excited to experience it with you. VIP email subscribers will be privy to the early release of this starting on Saturday along with a discount. So, if you are not an email subscriber yet, now is the perfect time to become one and get in on the early discount and deal – just sign up in the box below! I am too! I have had a few sample test roasts that Adam was working on and it is incredible! It was only enough for a couple cups though so I am looking forward to getting a full bag.